Amazon is on a mission to mechanise as much of its supply chain as possible, and has—through publicly available documents—considered autonomous vehicles, drones that react to screaming, and flying warehouses. Among the strangest is a patent application which became public yesterday, and it’s, uh, some sort of crane game jellyfish thing. First filed nearly three years ago, “Collaborative Unmanned Aerial Vehicle For an Inventory System” would be composed of a “buoyant airbag,” several propellers for lift and directional movement, and a “retention feature,” otherwise known as a big ol’ claw. 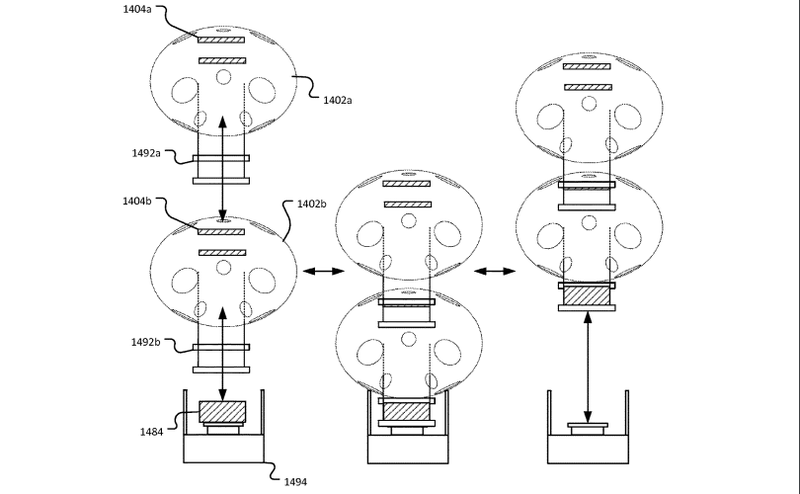 Some illustrations even show these bubble bots joining together vertically to (one assumes) handle increased payload weight. The humans who staff Amazon’s warehouses are made to work so quickly their jobs have reportedly resulted in repetitive strain injuries even when performed correctly. What could a slow-moving drone possibly do to increase efficiency? According to the patent application, the problem it solves is purely spatial. “Inventory systems are now occasionally split between ground floors and mezzanine levels within a large structure,” it reads, “moving inventory items into or out of densely packed storage areas can be inefficient using existing ground-based units.” So much vertical space wasted, all because buildings just happen to be designed for people to use them! While even Amazon’s “dystopian” haptic feedback wristband was rumoured to have been given a limited test in a Washington state warehouse, there’s no indication the jellyfish crane robot ever made it past the application phase, though we’ve reached out to Amazon to confirm that’s the case.